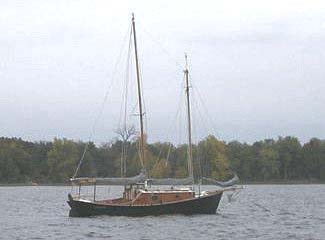 WINDWARD 28 is a cruising version of her successful shallow draft sisters. She has generous accommodations in her cabin. Her arrangement drawing shows a vee berth forward, galley to port, storage to starboard, two settees and a porta potty to pull out from under the bridge deck Other arrangement options are possible including an enclosed head and quarter berths extending under the cockpit. Her self bailing cockpit is large for family and friends to spread out. Storage is provided in the lazaret and under the cockpit seats. She is suited for a 15hp outboard or a 10hp inboard. She will sail upright and go to windward well as her name indicates. The split ketch rig is easy to handle and reduces easily when white caps appear. Her hull is glue and screw 1/2" Plywood and epoxy on plywood bulkheads and straight frames. 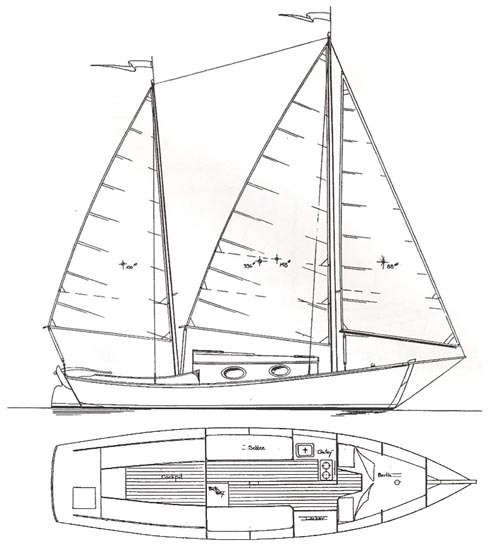 Plans include: materials, lines, construction, and two sail plans. Build her and enjoy extended cruising in thin water. Estimated cost for quality construction materials (not including power or sails) is $32000. This cost includes a high level of outfit and finish you can be proud of after putting the effort into building this fine boat. Purchase and Download Study Plans for the WINDWARD 28 for $5.00 in PDF format (zipped file). Purchase Construction Plans for the WINDWARD 28 for $320.00 for delivery by US Postal Service. Purchase Full Size Frame Lofting for the WINDWARD 28 for $320.00 for delivery by US Postal Service.